Kaimeng Huang is an international strategist and change maker with 20 years of experience in planning and executing global and local initiatives and programs. She currently runs Acusea Capital in Palo Alto/California and Huiyuan Capital in Beijing, venture capital firms that are dedicated to investment in a new generation of design start-ups and designers who drive innovation through the integration of design and technology. Starting in 1998, Ms. Huang enjoyed a successful career with Adobe where she led the creation and development of international and regional initiatives. Starting with the management of the globalization/localization strategy, she was responsible for a team that grew international market revenue by over 50% while lowering operational costs. In 2008, Ms. Huang moved from San Francisco to Beijing in order to build the China Globalization R&D Center. Serving as chief strategist and champion of the Chinese market for Adobe Creative Cloud and the move to a cloud services model, Ms. Huang built three Centers of Excellence in China with 270 employees. For her outstanding leadership in expanding Adobe’s emerging markets, she was awarded the “Founder’s Award” in 2011. As a Stilwell Scholar, Ms. Huang is passionate about entrepreneurship, cross-cultural communications, and women’s leadership. She is one of the authors of “Ecosystem of Innovation in Silicon Valley and Implications for China” (Fudan University Press, 2005 and 2015). 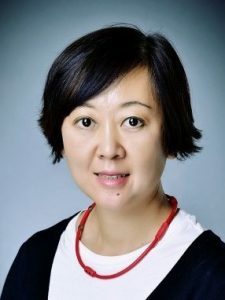 A former research fellow at Stanford University’s Asia Pacific Research Center, she received her MBA from Middlebury Institute of International Studies and a MA in Simultaneous Interpretation from the United Nations Training Program for Translators and Interpreters of Beijing Foreign Studies University. Ms. Huang spends her spare time working as volunteer for Hong Kong based Yes We Do Education Foundation, which promotes equal education opportunities for children from China’s underdeveloped rural area.